We live in a Victorian house which is an ongoing project. Consequently, we have a reception room that is still on the to-do list, and needs fairly major work such as a new ceiling. The upside of this is I am allowed to do pretty much what I want in this room, so each year at Christmas time, out comes the staple gun, and the room gets a makeover of Ivy, Holly and anything else that takes my fancy to cover up the large gaps between the walls and ceiling. 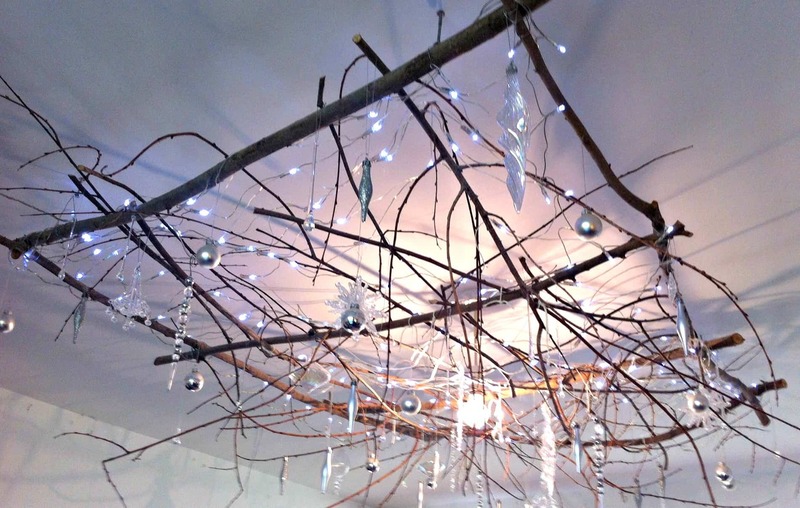 For the last few years we have had a Twig Chandelier in the centre of the ceiling, it may not be to everyone’s taste, but it is a brilliant way to brighten up a less than perfect room, so I thought I would share our video on how we put it together. I have collected these glass baubles for a few years now (just buying 2 or 3 each January) but you could make equally lovely ones using the drops off old chandeliers or other glass beads threaded on wire, or even crystal ones you have grown yourself. If, like I often do, you end up leaving the twigs up as a more permanent feature, they look equally pretty with other decorations on them, such as Easter Eggs, or little felted birds. For more unique nature inspired home decoration ideas check out our gorgeous air plant and wire jelly fish, our woodland table decoration and our bark covered flowerpots. I am so excited. I am going to go get my twigs tomorrow. Thanks. Sarah, I’m just dropping by from the “Wrapping up the Holidays” link party to let you know that you are one of my features. Congratulations and Happy Holidays! Thank you so much! Now I have a plan to go forward with my project. How are the lights turned on/off…hardwired, battery pack? I apologize if I am asking the obvious. This is beautiful! Thanks Betty. The lights plug into the mains. Fortunately they are on a really long lead so we were able to run it up the corner of the room and disguise it with some foliage. Sarah, this is an amazing project!! No one would notice the gaps between the walls and the ceiling, and I am sure it will look great not only with Christmas decor. What an excellent winter project, I love it! Sarah, this is amazing! I love how you bring the outside in, this looks like a winter fairy land. I bet it is the focal point of this room, who would ever notice other imperfections when gazing at this beauty! I would leave it up all year round too! It’s stunning! Thanks Nikki, it does look pretty with all the glass reflecting the light and it definitely does the job of distracting from the ceiling itself! This is absolutely stunning Sarah! Such a unique centerpiece for the room. A showstopper really. There are not enough nice things I can say about it! Oh I really love this, it turned out so pretty! Would love to have something like this on my patio. So pretty! What a cute idea. Looks so pretty. OMW, this is sooooo pretty. I want one. It is perfect for high ceilings, I’m going to try making something similar outside this year as well, presuming it eventually stops raining and we get a summer! Thanks Claire, we love it too, I’d love to do something similar in the garden this year, just in case we get a summer! Really love this! You’ve inspired me to create something similar on our back patio. I hate the light we have out there and would love to have something more rustic yet magical like this. Thanks! I love this, our local pub dies the same thing but uses the old rafters as the frame and builds it from here, last year they did it and kept it up for my Husband’s 50th birthday there in February, in the end they left it all year and it is always admired. I love your video to support the post and relaxing music!